Three Manchester University choral groups are coming together for a spring concert designed to lift the heart. "Dance, Dance My Heart" will feature three choral ensembles: A Cappella Choir and Chamber Singers conducted by Debra Lynn, MU director of choral music; and Cantabile conducted by Scott Avery. The performance is 3 p.m. Sunday, May 10, in Cordier Auditorium on the North Manchester campus. Admission is free and open to the public. 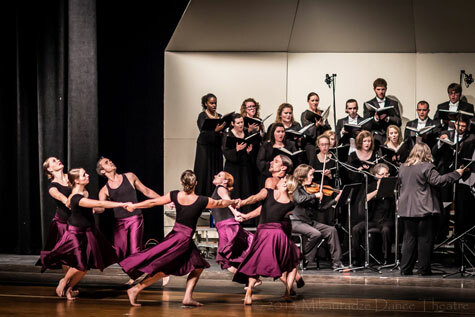 Mikautadze Dance Theatre from Fort Wayne will join the Chamber Singers to perform Four Motets by Aaron Copland. Cantabile will also have a guest flute, bass and drums in its portion of the program. A Cappella Choir is an ensemble that maintains 40 to 50 members and is open to all Manchester students, regardless of their major field of study. The choir tours each year after commencement ceremonies in the spring and has given performances at Carnegie Hall and the Vatican. Cantabile is an auditioned women's chorus that performs music of all eras composed especially for treble voices. Chamber Singers specializes in music of all styles that is composed especially for small groups. This ensemble is auditioned from within A Cappella Choir. The Chamber Singers and Cantabile perform throughout the academic year at area high schools, residential communities and various civic functions. Interested in applying to the MU music program?